This week's Fail Friday goes to Raby Tavern. 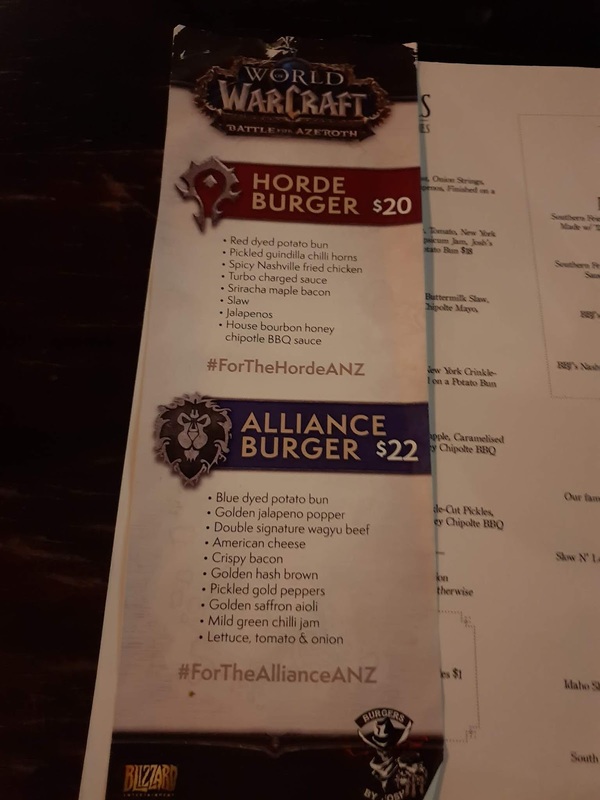 We had this great evening planned to go try these Battle for Azeroth burgers by Burgers by Josh. He had them at 2 Sydney pubs - Raby Tavern and Annandale Tavern. So, since Raby Tavern is close to work for me and on the way home, I thought I could get Koda to come. And Guns and Rotticus since they were out that way. Erve too, he's not far! And Consti as well. Ayelena jumped on the bandwagon and said he'd come too! So here we are, all set to go, and I had even messaged Burgers by Josh to ask if they would still have them and they said yes! But yesterday, the day before we were going to go, Koda rang them and they said they ran out of the coloured bun and weren't getting anymore! BOOOOO Naughty Raby Tavern! I guess it's possible that it was more popular there? I rang Annandale and the person on the other end told me that they still had them in Annandale and they would STILL have them on Friday, so I asked everyone but only Ayelena and Corael and HK would come. It was after all, a big hike out to Annandale from Campbelltown way. So off we went, and yes they were still on the menu! Well, ONE of us had to try the Alliance burger. I said we were eating it for research purposes. 3 Horde and 1 Alliance. Corael ate his burger SO FAST. Both he and Ayelena really enjoyed the burger! 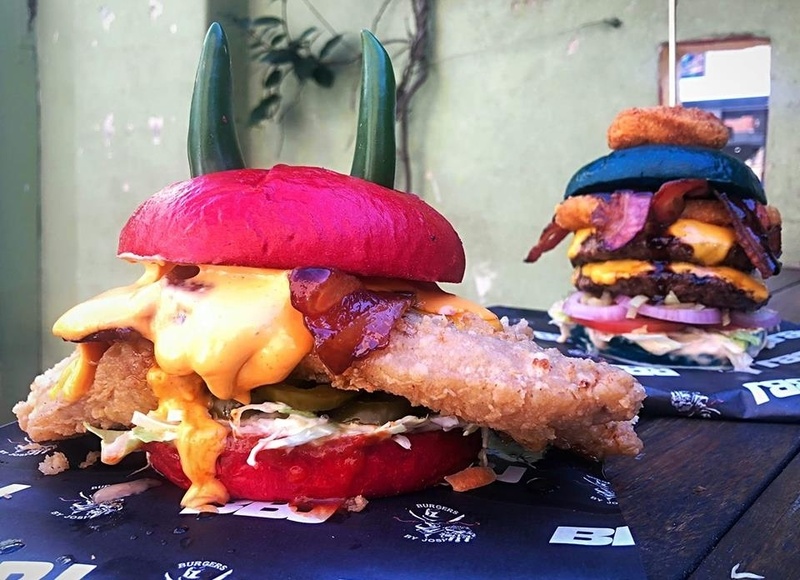 I think both burgers were well done, the problem is their size. It just feels too big to eat for me! By the time I was finishing the burger, it was a bit mushy and cold. The Horde burger was very spicy, which actually was quite good making it an adult only burger, in my opinion. The chicken was crispy and the maple bacon added a sweetness to the whole concotion that really is nice when you first bite into it. A sweet and spicy burger! The Alliance burger was a little spicy too, so if you can't handle a little bit of spice, then I'd have to suggest you avoided either burger. This burger tasted more like a standard burger. The potato bun wasn't too heavy, but I think it could be lighter, given the contents of the burger. And after eating the Horde burger first, I feel like the Alliance burger was a little less exciting in comparison. Ayelena ate 3 chillies, I only ate 1. It was hot, so I had to put ice in my mouth 3 times to cool off a bit. It wasn't TERRIBLY unbearable, but it was definitely hot!